This is the last part of a very long trail of posts about our beautiful daughter, Lara. If you haven't read the first four parts - Build Up To Lara's Birth, Lara's First Week, Lara's Second Week and Lara's Third Week - already, now is a good time to do so and come back. It'll put a lot of what is said here into context. One word of warning, of all the posts posted so far, this is the longest and most emotional of them all. This week started off pretty much where the last week finished: Lara was still on the ultra-high calorie feeds of 40ml every 3 hours and seemed quite content. The doctors and nurses were all happy with her progress too. Unfortunately, things started to get a little bumpy on the Saturday night (6 February) when the prostin machine (a syringe pump) started reporting problems with the long line (technically called a peripherally inserted central catheter) going into Lara's left arm. Whenever the syringe pump machine detected that the prostin wasn't flowing, it beeped very very loudly and flashed the message "OCCLUSION" to get people's attention and indicate the problem. I'd been in the room a couple of times before when this had happened, and on each occasion it was due to Lara bending her arm and compressing the line. That night wasn't one of those occasions. The machine alarm kept screaming and flashing the "OCCLUSION" message over and over again. The nurse would come in, check Lara's vitals, reset the machine and things would be fine for an hour or two before it went off again. At about 2am the doctors decided it was time to move the prostin infusion to the "spare" short line cannula in Lara's left foot. This worked for a while but the nurses soon found that this line was leaking and the prostin wasn't flowing as it should. 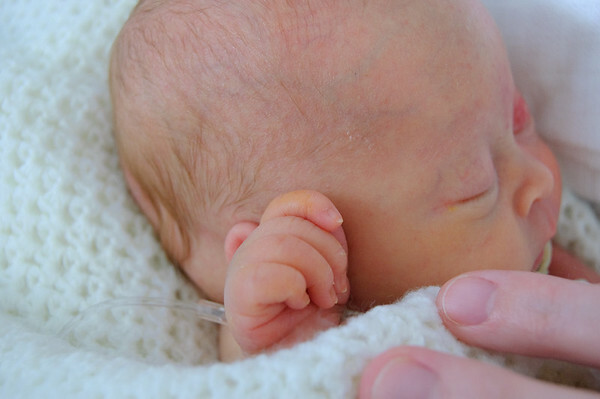 An on-call doctor was paged and a new short line cannula was inserted into Lara's head with the intention of a new long line being inserted at some point during the day on Sunday. Naturally neither Claire nor Lara got much sleep that night. The doctors spent quite a bit of time on the Sunday morning attempting to insert another long line, but were having difficulty finding a vein to host it. In the end they had to stick with using a short line and that afternoon Lara was moved to the paediatric high dependency unit (PHDU) in the main hospital where she could be monitored 24/7. It was at this stage that the doctors mentioned that surgery would most likely be brought forward to that Monday or Tuesday, a week earlier than originally planned. This would be confirmed on the Monday when all the cardiologists were in and the surgery roster checked. I was working that weekend so didn't find out about these events until Sunday afternoon when Claire's dad called me to say things weren't going too well. One of the concerns the doctors had always had with Lara was the amount of time she could be on the prostin. Whilst her body could generally cope with the prostin indefinitely, the veins are usually the limiting factor. In Lara's case, each long line seemed to last about a week of active use with each cannula, even less. I didn't go up that night as there would be no where for me to stay. I was also very tired from working the weekend shift. 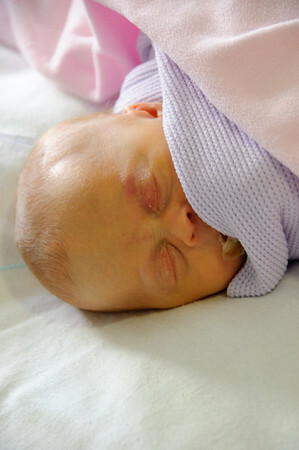 The nurses in the Bellhouse ward were very kind and allowed Claire to stay in Lara's old room that night. My original plans for that Monday were to take Claire out into Oxford town centre for the day to give her a break from the hospital. She'd been cooped up in the hospital for neigh on two weeks now with the only "outing" being the occasional short walk up to Headington High street. Given the weekend's events, this plan was very quickly scrapped and I headed up to Oxford with an overnight bag prepared for a long stay. When I left home we hadn't received any news on getting a room provided by the Ronald McDonald House Charity, but given how critical things were, I was prepared to sleep on the floor if I had to. By the time I arrived Claire had been informed a room had become available for us so we could stay there. There is an incredibly high demand for the rooms offered by the Ronald McDonald House Charity so they prioritize things with preference going to those with children in a critical state. 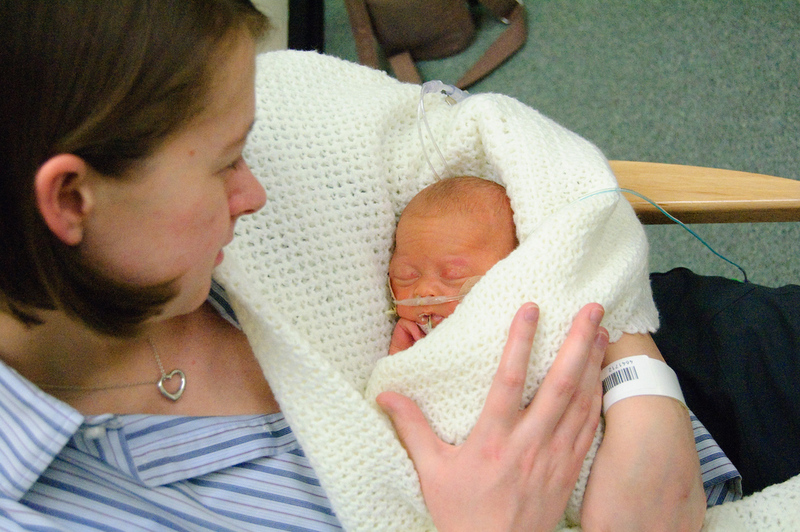 When I arrived, Claire and I went to go see Lara in PHDU. When we got there, the nurse briefed us on the night's and morning's happenings - no much - and explained that Lara was doing well except her post-ductal (ie after the aortic interruption) SpO2 stats kept dropping to levels they weren't comfortable with, even when she was perfectly relaxed or sleeping. We've seen these levels drop before, but this was usually attributed to crying, a full belly or being poked and prodded by various doctors. As a result they'd put Lara back on the CPAP to try and use air pressure to help keep the stats up. The nurse went on to say that the cardiologist and surgeon would be down at some point later that afternoon to check out Lara and also to go over the consent form required for surgery which had by now been confirmed for the Tuesday morning at 8:15am and then introduced us to a specialist who was monitoring Lara. Whilst we were having our time with Lara things became scary, very scary and very quickly too. The doctor who was observing Lara started to get a bit concerned. She wasn't happy with Lara's stats so she called the head of the PICU/PHDU who started his own examinations. Between the pair of them and the nurse they discussed Lara and confirmed the cardiologist, Dr Bentham, was busy and would be down to assess Lara further in about an hour and half's time. With that news, the two doctors there already continued their monitoring and assesses talking between themselves and the nurse. They decided to add some oxygen to the CPAP to try and help bump the levels. Next thing I know Dr Bentham marches into the room - probably within about 15 mins of us being told he'd be 90 more minutes - and proceeded to catch up with the two doctors and nurse. That was it. I broke. I burst into tears and ran off. I couldn't take it anymore. Those three words fell on me like a ton of bricks. I knew the doctors and nurses were doing a brilliant job but the suddenness of it all and the sudden realisation that our little girl was not doing well just knocked me for six. Surprisingly, Claire was the strong one here. She remained composed and she was the one who heard what I didn't hear: Lara let out a loud cry. I was so struck by those three words I completely missed the cry Lara let out immediately after the doctors said she wasn't breathing. It wasn't long before one of the nurses came to tell us that all was well again and Lara was fine. The prostin had actually just relaxed her heart just a little too much. When we got back to her she was back to her normal self with a new long line (Dr Bentham had inserted it whilst we were away) supplying a much lower level of prostin and good looking stats. Even through Lara now had a new long line, they weren't confident how long it would be effective. Dr Bentham was confident he'd be able to get a femoral long line in, but was reluctant to do so as this would be needed during and after surgery and he didn't want to jeopardize Lara's chances of recovery so they stuck with the plan of having surgery the next day. About 30 mins later Lara was moved to the paediatric intensive care unit (PICU) effectively booking her place and thus ensuring surgery took place the next morning. We spent the rest of the evening with Lara down in PICU and then made our way to our room. Saying good-bye that night was the hardest good-bye of all. Everytime I'd gone to visit Lara, the good-byes got harder and harder and it took me longer and longer to leave. Something about that day's happenings and the fact surgery was the next morning really sunk in and I didn't want to leave Lara that night. I'm pretty sure she didn't want us to go either. I also can't help but feel I saw something in her eyes and facial expression when we left which said she knew what was coming and that that would be our last good-bye. The next morning Lara went into surgery at 8:15am and the longest day of our lives ensued. The surgeon didn't know how long the surgery would take, but said he'd contact us later that afternoon. Claire and I spent the day anxiously wondering around Headington high street and the hospital until about 5:30pm when we got a call from a PICU nurse: Lara was still in surgery and the surgeon wanted to update us on Lara's progress. We met the surgeon and Dr Bentham in PICU and he informed us that things were not looking good. Lara was still in surgery on the heart bypass machine. The repair of the aortic arch went well and they were happy with the blood pressure in Lara's lower body thus indicating the repair was holding up, however Lara's heart was having problems with accepting the patch for the VSD. Apparently her heart wasn't pumping strong enough to support herself once they'd completed the VSD repair. In order to try and allow Lara's heart to recover, the surgeon said he'd removed the patch and was letting Lara rest with the intentions of trying to repair the VSD later on that evening. Leaving the VSD wasn't an option given it's size and the fact that the aorta was now repaired and working as expected. Apparently the two defects help each other in some strange way when combined, but cause problems on their own. We certainly weren't going to go with having Lara on a "portable" heart-lung bypass machine, possibly in pain and discomfort, on the remote chance her heart would recover in the next few days, weeks or even months. Claire and I have been very adamant and unified on Lara's treatment: we'd do anything necessary, provided she wasn't in any pain. At no point in Lara's treatment had she been in any real pain and given she'd been under anesthetic during surgery this would remain the case. Devastated, Claire and I returned to our room and waited. At about 7:30pm we received another call from the PICU nurse asking us to come down to PICU to meet with the surgeon and Dr Bentham. Our hearts sank. We knew this wasn't going to be good news. We headed over to PICU and met the doctors and were given the worst news in the world: our little angel had not made it through the surgery. Her little heart didn't manage to recover enough to support her. The surgeon explained that he wasn't quite sure why Lara's heart couldn't cope with the simpler part of the the operation and said even if the law hadn't required it, he would be referring Lara to the coroner to try and get a better understanding of why her heart had problems with this part of the surgery. The PICU nurse's training and compassion then kicked in. She was absolutely brilliant. She offered to bring Lara in to us for a last cuddle, suggested making hand and foot prints onto some card and asked if we wanted to bath and dress Lara. We declined the bathing and dressing as we really didn't want to see the scars on her chest but we did agree to the cuddles and the prints. We'll never forget those last, or any of the previous, moments with Lara. Just over a week after Lara's death we were notified of the coroner's findings. He'd found no signs of malpractice or error by the surgeon or his team and declared the cause of death as acute myocardial ischaemia which I understand to be a lack of blood flow within the heart muscle and very similar to the condition that causes heart attacks in adults. Despite what other people and the press report about the NHS, Claire and I have experienced nothing but the highest levels of professionalism, care, attention and compassion. The doctors and nurses we've engaged with over the last 6 months have been absolutely brilliant and worth their weight in gold and we couldn't fault them in any way. I hate to think what this would have cost us had we had to pay for all of this and I don't believe the level of care we would have received would have been any better had we had no choice but to pay. Ever since we found out Lara had a heart problem, we knew things would be tough and there was always a very real chance things would end like this. Whilst we'd been realistic about the possible outcomes from the very beginning, we always tried to look on the bright side. Nothing can prepare you for the loss of a child, no matter how much forewarning you have. We're very grateful for the short period of time we had with our little girl and will cherish and remember every moment for the rest of our lives.